This is a gentle story about family separation with a happy ending. Betty and Paul are two little birds who build a nest together in a cherry tree. Betty lays an egg and out pops Baby Bird. Everyone is happy and all the other animals come to see the baby. 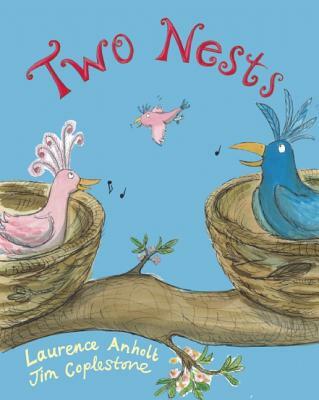 But the nest is small, Betty and Paul squabble, and they decide that Paul should live in a different nest across the other side of the tree… Now there are two nests in the cherry tree. But Betty and Paul both love Baby Bird, and soon he is able to fly over the cherry tree, visiting his Two Nests.